1948: The last time Colorado Boulevard was reconfigured. The year that the 5 Line streetcar tracks were ripped-out and six multipurpose traffic lanes were installed. On Sunday, March 22, pedestrian advocacy group, Los Angeles Walks hosted an ambassador-led walking tour of the newly traffic-calmed Colorado Boulevard from Swörk at Eagle Rock Boulevard, up to Eagle Rock’s Eagle Rock at Richard Alatorre Park. The walk was led by Glassell Parker and Occidental College’s Urban and Environmental Policy Institute professor, Mark Vallianatos, and Eagle Rock Neighborhood Council member, Ashley Atkinson. The walk served as a fundraiser for the Los Angeles Walks organization and as way to highlight the pedestrian improvements to Colorado Boulevard in the past year. There were kids in strollers, dogs on leashes, a family on razor scooters, neighborhood council members, urban planners, and walking enthusiasts from as far as Santa Monica. We walked up Colorado, stopping to note the history of the boulevard, the history of LA City planning and building codes, as well as the recent improvements like the new crosswalks, and the road diet that replaced one multimodal travel lane with a buffered bike lane. As we walked one fact stood out more than any other: Colorado Boulevard is LOUD. Very loud. So much so, that even though the guides used a bullhorn, much of the tour guiding was unheard due to roar of auto traffic racing up and down the boulevard. This points to another issue that has become more apparent recently: The desirability of Colorado Boulevard to small businesses. More new businesses are choosing the narrow street of Highland Park’s York Boulevard over Eagle Rock’s broad and heavier auto trafficked streets. Because of the lack of galleries, the monthly 2nd Saturday NELA Art Night has almost completely abandoned Eagle Rock for Highland Park. Just this month, Chicago import, Permanent Records moved their store from Colorado Boulevard to York Boulevard, in large part because York Boulevard feels like a village, whereas Colorado Boulevard feels and looks like a highway. And yet, this is as far as Colorado Blvd has come. The Colorado Vision Plan, speaks of a better future where there will be bulb-outs, sidewalk extensions, landscaping, shade trees, parklets, transit shelters, benches, and possible cycle tracks. But this is Los Angeles, where anything that doesn’t have well-monied lobbyist pushing for it, it doesn’t get done. To CM Huizar’s credit, his CD14 is by far, the most progressive when it comes to Complete Streets. Meanwhile, just eight miles away in sleepy Temple City, they are completing a $20.7-million project that re-invents Rosemead Boulevard (Another street that was originally a streetcar line) as a pedestrian and bike-friendly boulevard instead of a minor highway cut-through between the 10 and 210 Freeways. The same thing can be seen throughout California. The military beach town of Oceanside is in middle of redeveloping their downtown with Complete Streets. The first in L.A. County to truly embrace Complete Streets was Long Beach back in 2011. The People’s Republic of Santa Monica continues to make strides, regardless of the pressure from Westside automobile commuters. The list continues to grow where cities are parking cars, and putting people first again. Eagle Rock and Highland Park both have these great pedestrian-centric walkable neighborhoods developed a hundred years ago as streetcar suburbs. We just have to build upon the bones that survived, and get out of our cars and back on our feet. Los Angeles’ Walks, Deborah Murphy introduces. Colorado and Eagle Rock Boulevard with the new road diet. The center once featured a merry-go-round canopy in the center where pedestrians could wait for the streetcar. Walking past the car-centric warning sign at CaCao Mexicatessen. 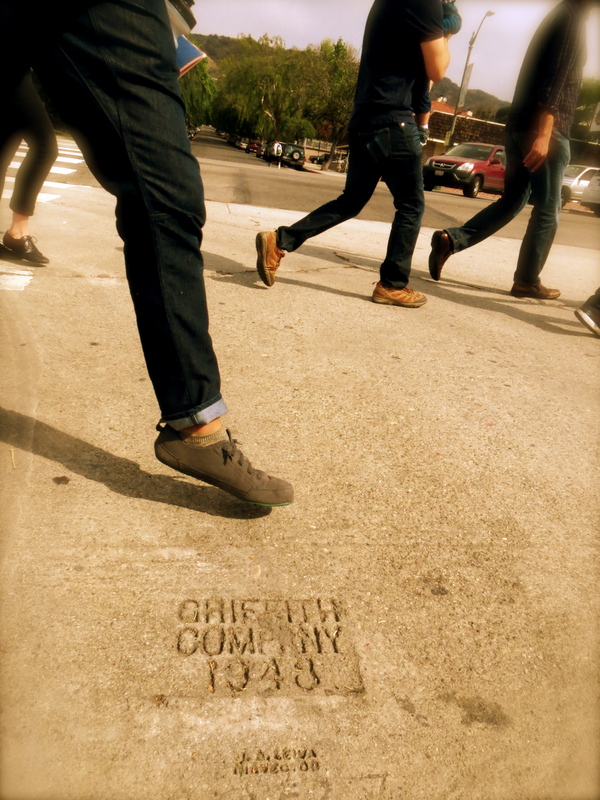 Panarama of walkers across from the 1922 Eagle Rock City Hall. Mark Vallianatos talks about the mini-mall-ization of Colorado Blvd. New crosswalk with beg button activated warning beacons. Yellow Continental Crosswalks = School Crossing. Cyclist enjoying the new buffered bike lanes. Crossing in a school zone. This plaque at Alatorre Park sums it up. Last Continental Crosswalk on Figueroa. Loved this write up. I forget where I read it, maybe it was here. How LA was filled with street cars but the auto manufactures bought out and dismantled the programs. Makes me wonder what it was like… Hmm… I also wonder maybe that’s why a major street in san fernando is a 15 mph zone. Was thinking it was a speed trap but I guess they’re just trying to make me stop and smell the roses.